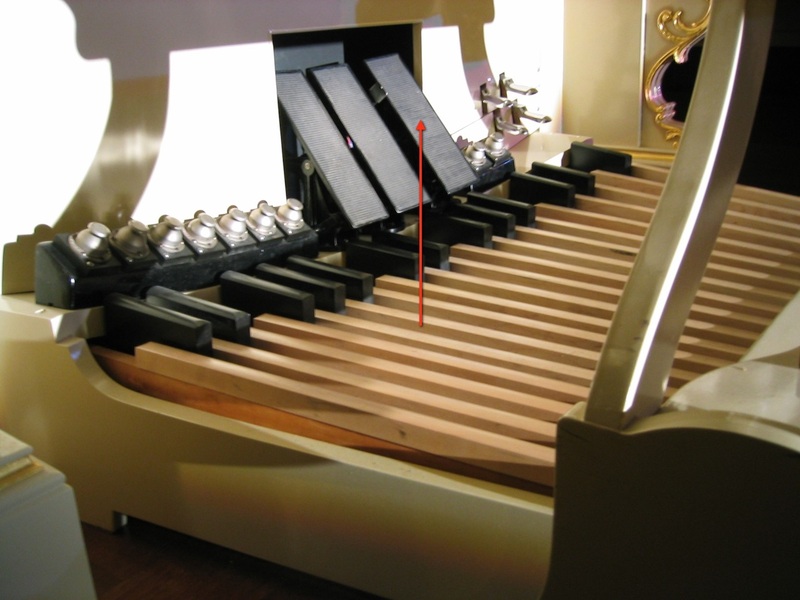 The crescendo shoe (photo, red arrow) is a device found in pipe organs of medium to large size which is operated by the organist's right foot in the same manner as a swell shoe; it selectively adds stops and couplers when the shoe is depressed toward the horizontal and retires them when it is drawn backward to a more vertical position; many larger electronic organs are also fitted with this device. The crescendo shoe is situated to the far right of any other swell shoes and typically has a slightly raised surface to make it easier for the organist to find it with the right foot without looking down; it is also typically supplied with a display to indicate to the organist how far open or closed it is at any given moment. As Ed Sullivan would say, this device is, in a very real sense, "a really big shoe" -- it's needed in fact for performing certain organ pieces from the standard Romantic, Modern, or Contemporary repertoire and for effecting sound changes when performing arrangements and transcriptions of music not originally written for organ. Pianists moving to the organ will need to make sure, when they begin to play, that the crescendo shoe is all the way back and not mistaken for one of the swell shoes. Whenever the music demands a change in the sound, there is no console assistant available to add or retire stops (which is most of the time), and the organist's hands and left foot are so occupied that not even a toe or thumb is available to press a piston, the crescendo shoe comes in handy in the buildup to full organ. Conversely, whenever the music has reached a fortissimo climax and must then recede to a very soft dynamic, the crescendo shoe also comes in very handy; in this situation the thumb pistons can be used in the buildup, then the crescendo can be opened to equal the power that's already on; then, by pressing the piston with the softest combination, the crescendo can be gradually closed; this can be artistically controlled to effect a seamless diminuendo from full organ down to the softest whisper. In an ideal situation, the crescendo shoe would be programmable by the organist and equipped with 20 or more separate positions; it would also be relatively stiff to operate -- much more so than any other shoe situated to its left. Obviously, with such a device at the organist's ready command, the watchword is CONTROL; from the performer's perspective, complete control may not be possible to secure when the crescendo shoe moves just as freely as any of the others, has only a few positions, lacks a display of any kind, and is non-programmable. Fixed factory-programmed crescendo combinations all too often add the biggest reeds, all imitative color reeds and strings, all mutations including 3rd sounding ranks, and all big tubby-sounding flutes and diapasons in the buildup to full organ; this results in an opaque, thick sound that tends to cloy upon the ear; on the other hand, when the organist is able to program the buildup to leave out these same voices and builds the full organ around a narrow-scale principal chorus, chorus reeds, and upperwork, we have a much leaner full organ with a more transparent sound, a more interesting sound in fact which can be listened to, if necessary, for much longer stretches of time. With a crescendo shoe that operates too easily, it's very easy for the slightest touch of the right toe to accidentally move it when the organist doesn't want it to move. This device requires practice to operate artistically, but it adds a valuable dimension to organ playing which nothing else can.